1. All programs must be paid in full at time of registration. 2. No credits, refunds or transfers will be given to a registrant who leaves because of their own desire or failure to attend. 3. The Utah Olympic Oval reserves the right to reschedule, change or cancel a program due to unforeseen circumstances. The Learn to Skate USA program at the Utah Olympic Oval is sanctioned by U.S. Figure Skating and therefore, all members are required to pay an annual registration fee that provides coverage July 1 – June 30. 1. Skaters must pick up new I.D. badges on the first day of each session at the LTS check-in table. Please arrive approximately 15 minutes prior to the start of class to receive your badge and prepare for class. 2. I.D badges must be presented at Skate Rental in order to receive skates. No exceptions. 3. I.D. badges must be worn and visible at all times during class. Skaters without badges will not be permitted on the ice. 4. Replacement I.D. badges will be issued at the check in table. All new students will be evaluated on the first day of class to be placed in the appropriate class level. This evaluation will occur during the first 5 minutes of class. It is critical that you arrive on time to participate. Parents/Guardians – Please note that instructors are available before and after class to address any questions or needs for assistance. 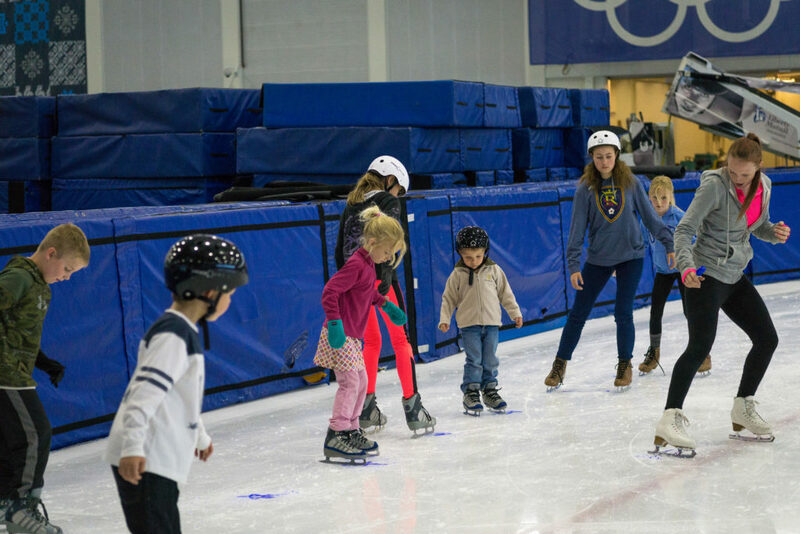 When you enroll in Utah Olympic Oval Learn to Skate classes, you become a member of the Learn to Skate USA program. Each new participant will receive a booklet explaining the class structure and level in which the skater is participating. Class/skater progress reports will be given on the 3rd/4th week of class. Class evaluations will be held on the 6th or final week of class. If a skater is ready to progress, they will be placed immediately in the next level. As skaters complete levels they are eligible to receive Achievement Badges handed out by the test administrator. Any class not meeting size requirements may be cancelled or combined. No make-up classes will be offered. In the event of an absence, a one (1) time compensation per session of two public skating passes will be awarded. Requests for refund consideration must be submitted in writing two (2) weeks prior to the first day of the registered session. A refund, credit or transfer will be approved only in the event of injury or illness that is accompanied by written confirmation of a doctor within 30 days of illness/injury verifying nature of illness/injury. Please note, there will be a $10 administrative fee assessed to any refunds, credits or transfers awarded. Credit and transfers will expire six (6) months after date of issue. No refunds, credits or transfers will be given to a registrant who leaves because of their own desire or fails to attend.